Sri Lanka’s early elections are expected to be a close race between Mahinda Rajapaksa and his opponent. Millions of Sri Lankans went to the polls on Thursday to vote in a crucial and close election that will decide whether current Sri Lankan President Mahinda Rajapaksa remains in office. The election took place amid reports that the Sri Lankan military was on standby for any potential election-related violence — the military’s state of readiness was unknown to Sri Lankan election authorities, who announced that they would investigate the situation on the eve of the election. Rajapaksa’s opponent is a former rival, Maithripala Sirisena, who has a growing base of support across the country. As The Diplomat reported in October, the Sri Lankan government decided to hold elections two years ahead of schedule. 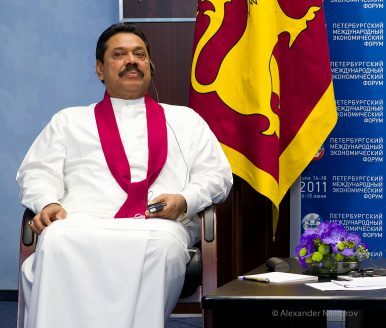 Current president Mahinda Rajapaksa, who won a landslide victory in 2010, was the favorite to win the elections at the time the January poll was announced. Rajapaksa, who was president for a first term starting in 2005, stood for reelection after Sri Lankan legislators voted to amend the country’s constitution’s term limit clause. This allowed Rajapaksa to repeatedly run for the presidency, including this year. Rajapaksa’s opponents have claimed that he has the makings of a dictator, both in his style of leadership and in his determination to repeatedly stand for election. Sirisena, contrasting with Rajapaksa, draws the majority of his support from Sri Lanka’s ethnic minorities. Rajapaksa has come under both domestic and international scrutiny for alleged war crimes committed by his government against the separatist Liberation Tigers of Tamil Eelam (LTTE) in the final phases of the country’s civil war. In early 2013, the United Nations Human Rights Council (HRC) called for an international probe of the country’s Northern Province to gather evidence of such abuses. Despite the criticism over alleged rights violations during the civil war, many of Rajapaksa’s ethnic Sinhalese supporters, the majority ethnic group in Sri Lanka, support him for the crucial role he played in the country’s civil war. Rajapaksa’s confidence going into this election was further buoyed by the strong performance of the Sri Lankan economy and the government’s strong handling of its finances. Starting in fall of last year, the Rajapaksa government boosted handouts and populist programs to increase his electoral chances. As an example, the government increased farm subsidies and gas and diesel subsidies, lowered tariffs on utilities, and distributed free seeds for rice farmers. The government also boosted public employee compensation and delayed scheduled tax increases. In 2010, Rajapaksa won just under 58 percent of the vote. Results from Thursday’s election will be released on Friday. Will Sri Lanka chose a return to corruption, misrule, and near-authoritarianism?